Because this is our 29th year of offering camps, our counselors are among the most experienced chess teachers found anywhere. 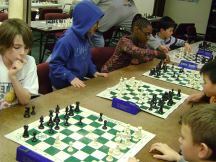 We coordinate daily activities and instruction to expand the students' chess skills. Chess is known to teach logic, problem solving, analysis techniques, and will improve study habits. These skills will carry over to school and career. But the main reason kids come back is. . .
Camps are available to kids age 5-13 years. All skill levels from beginner to advanced are encouraged to come. Beginners who arrive without any knowledge of the game will become proficient players from their camp experience; advanced players will benefit from sharing classes and experiences with some of the top youth players in the US. 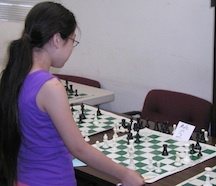 Rochester Chess Center is adjacent to Cobbs Hill Park, where the daily outings are held. Seasonal activities, like frisbee, soccer and hiking are planned so come dressed for the action! We allow for early drop off (after 8:00am) and/or late pick up (until 5:30pm) at no extra cost. Send your deposit (1/2 of the camp fee) to reserve your spot! Campers may attend single days.